The world and its institutions celebrate the eighth of March every year, to celebrate the woman and her achievements, affirm her rights, and demand more laws and legislations that do her justice. Palestinian women suffer from repeated and escalating violations due to the circumstances under which they live and the systematic policies pursued by the Israeli occupation authorities for more than seventy years. Among the one million Palestinians who have been incarcerated in Israeli jails, there are more than ten thousand Palestinian women tortured and detained since 1967. Today , 62 of them continue to suffer in Israeli detention camps, including 7 minors and 17 mothers in Damoun and Hasharon prisons. Nine of the prisoners suffer from deliberate medical negligence specially the ones that were arrested even though they were wounded, and perhaps the case of Isra Jaabees is the real cry for the world to intervene quickly and effectively to save the Palestinian women who are deprived of their children and families, and where the occupation authorities intentionally blackmail the issue of her treatment to leave her captive between walls and pain. The entire world watched what Ahed Al Tamimi has been exposed to from systematic physical and psychological cruelty which by itself is a cry and a curse on anyone denies the suffering of Palestinian women. Palestinian women constitute approximately 50% of the total population in Palestine, but they continue to suffer from deprivation and the cruel practices of the occupation. In addition to the policies of detention, their lives are targeted through the deliberate killing by the Israeli soldiers and settlers, and through targeting her family members with field executions and the detention of their bodies. Furthermore, the occupation deny them freedom of movement to access education and health services by the blockade and barriers and travel prevention, and perhaps women in the Gaza Strip are the most suffering from this type of punishment, in addition to the deprivation from decent livelihoods through the confiscation of land and water resources, the prevention of construction and the demolition of houses. At the National level, women suffer from the absence of legislation that protects them from gender-based violence and killing on the grounds of "so-called honor". Women also suffer obstacles in the labor market in regard to the placement of senior positions and fair pay. In 2016, the proportion of female participation in the labor force was 19.3% of the total females in working age with a gap in the daily rates of wages between females and males. The average daily wage for females was 83.3 NIS compared to 114.1 NIS for males. Official statistics indicate the gap between males and females in Palestine. In 2015, 82.8% of judges are males compared to 17.2% females, 77.5% of practicing lawyers are males compared to 22.5% females; 83.3% of prosecutors are men, compared to 16.7% of women. The percentage of Palestinian female ambassadors did not exceed 5.8% compared to 94.2% for male ambassadors, 21.1% of Engineers registered in the Engineers Syndicate are women, compared to 78.9% of men. 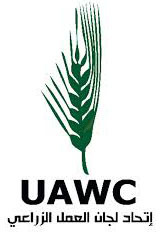 Around 23.2% of the members of the Student Council in West Bank universities are females, compared with 76.8% of males and 42.6% of civil servants in the civil sector are females, compared to 57.4% of males. Only 11.7% of the females in civil sector are in general manager position or above, compared with 88.3% of males in the same positions. We at Health Work Committees, are proud of the values ​​and policies that govern the work of our organization , which is characterized by the presence of more than 60% of its employees as females, the presence of a woman at the head of the organization as general manager and the presence of 30% women in its board of directors. And to top that, we established the first and only specialized center for the diagnosis of women cancers, seven years ago, in addition to the establishment of Ishraqa Centers in the north and south as a safe space for women, providing various services targeting women specially the support for women victims of violence, offering psychological counseling, social and legal services in addition to sports, nutrition and educational services. 1. The necessity of exposing the practices of the occupation against Palestinian women as they are the most affected by its racist practices and demand the national and international pressure to liberate the prisoners specially the female prisoners, specifically the wounded Israa Al-Jaabees and the child Ahed Al-Tamimi. 2. The provision of freedom of movement and travel for women to work and health services in accordance with international conventions and laws governing the reality of people under occupation. 3. 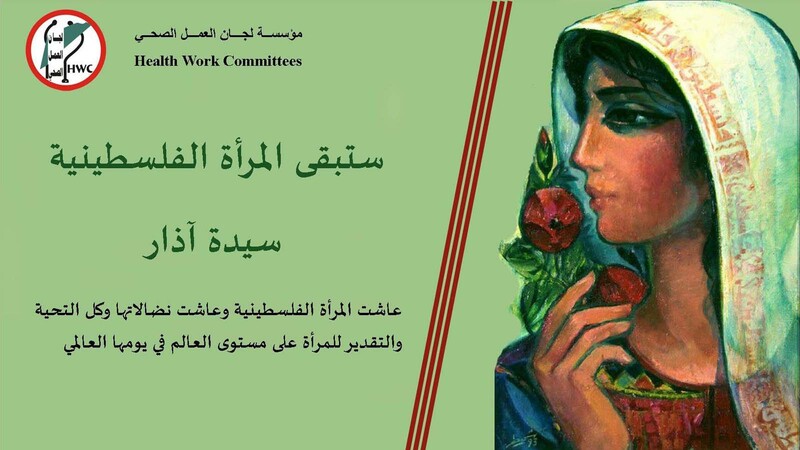 The indorsement of international conventions and charters relating to women and their activation in public life by the Palestinian political system. 4. The adoption of community and legal appeals to amend the provisions of the laws on women, violence, family and children. 5. The termination the political division and erasing its consequences, in which women were the biggest victims. 6. The protection of Palestinian women and women in general in conflict and war zones, particularly in Syria, Iraq, Yemen, Bahrain, Libya and other areas. 7. We welcome the recent decisions of the Palestinian Cabinet concerning a series of measures to eliminate discrimination against women, in particular to allow a woman to obtain passports for her children, to allow her to open bank accounts for her children, and allow her to transfer them from schools. We also affirm to enforce equality in all fields. 8. Combating and addressing the American-Israeli attack on Jerusalem residents and establishments, especially after the racist and unjust decision by the White House administration regarding the occupied city of Jerusalem, is a support for Palestinian Jerusalemite women in their struggles and right to live in the occupied city and the right of the rest of the Palestinian women to access Jerusalem.